Jacksonville Shooting Witness Recalls 'People Crying' And 'Running For Their Lives' Ryen Aleman tells NPR how he and another gamer hid in a restroom to avoid the shooter. As the two huddled in a stall, they could hear gunshots and the cries of people who had been hit. 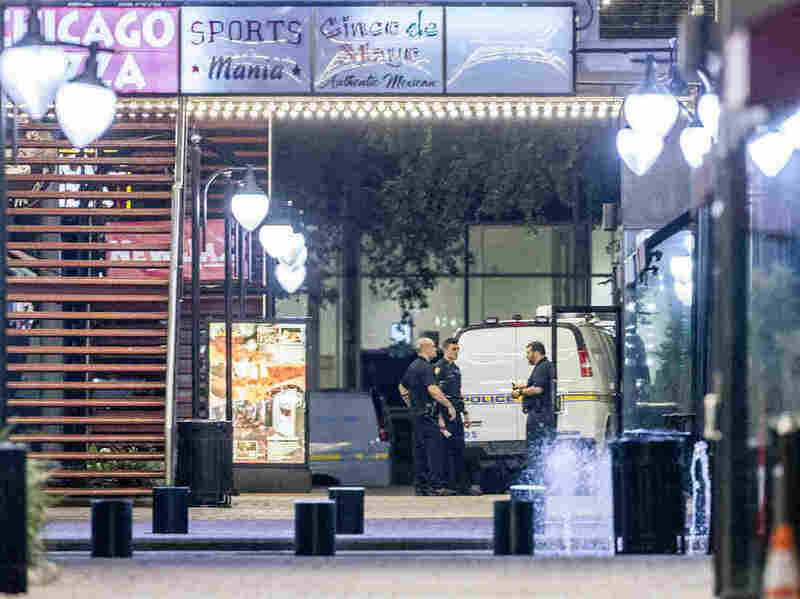 A heavy police presence remained into the night at the scene of the shooting inside Jacksonville Landing on Sunday in Jacksonville, Fla.
Moving as fast as they could on their hands and knees, the two entered a stall together, closed the door behind them and stood on the toilet, reasoning that the sight of their feet from under the stall might tip off the gunman. "I was praying. And I was saying, 'Don't worry. Stay with me,' " to his tournament competitor who now suddenly took on a far different role: survival partner. "I can't tell you if we're going to stay alive or not, because if he opens this stall, he's going to shoot us," Aleman, 25, told his companion. "If he does, this could be our last day." As the two were bracing themselves, a horrific soundtrack filled the cramped bathroom stall. At a news conference Sunday night, Jacksonville Mayor Lenny Curry told reporters that the shooting was "all too common." Authorities said Sunday that 11 people were injured. Nine of the injured sustained gunshot wounds, but officials say all are expected to survive. Police have not yet announced the identities of the two men who were fatally shot. Officials would also not say whether Katz, the gunman, knew any of the victims. Twitch said in a statement that "we are shocked and saddened by the tragedy that took place in Jacksonville," adding: "Twitch and all its staff send our deepest sympathies to the victims, their loved ones, and everyone in our community who's grieving." On the website for Electronic Arts, which has sold more than 100 million copies of the Madden series, the company called the incident a "senseless act of violence that we strongly condemn." A previous version of this story incorrectly referred to the company Electronic Arts as Electric Arts.